OK, it’s time to make Agri-West look like it has survived a couple of decades of Marty, sun, snow and wind in the American West. Don’t drop by unless you have enough time to chat. Marty will serve you a cup of bad coffee in a styrofoam cup and get you caught up on his grandson who plays right tackle for the Wildcats, the Carrizo Springs High School football team. If he really likes you, he will give you a Purina calendar. Marty is proud of his restoration job on the John Deere tractor to the left above. It is spotless. Just enough interior to be plausible. I don’t intend to illuminate. The trick is to age without making it look abandoned. This is still a thriving concern. It is an important part of the community. This is 1981 when people were better about reading the newspaper, reflecting and chewing the fat with neighbors at places like Agri-West Supply to figure out how to vote or think about things. Few folks sat around letting other people tell them how to feel about societal issues. Sitting on tractors or repairing fences in the middle of nowhere gives you a lot of time to think and be an individual. That sign is a little rusty. It gives the building character. The back is pretty non-descript. 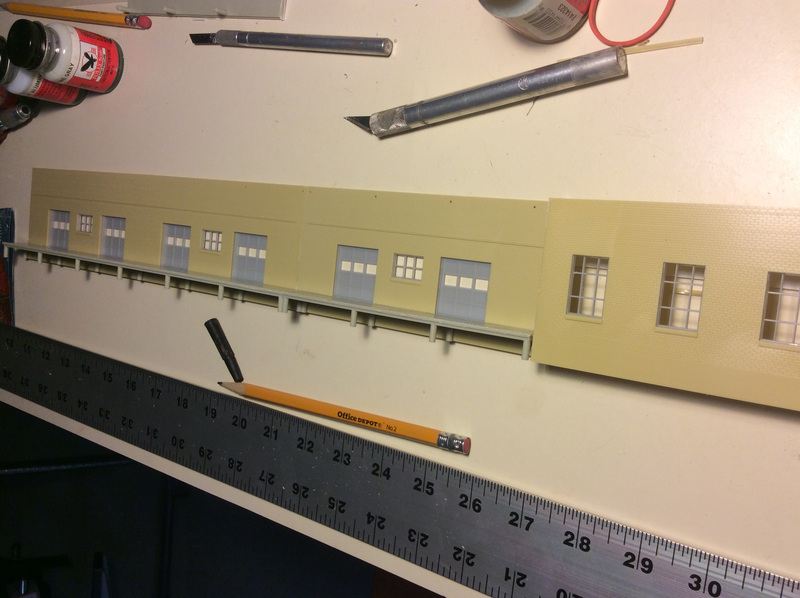 The rail side of the building is not seen, but survives scrutiny should the Rails West layout get a curious visitor. 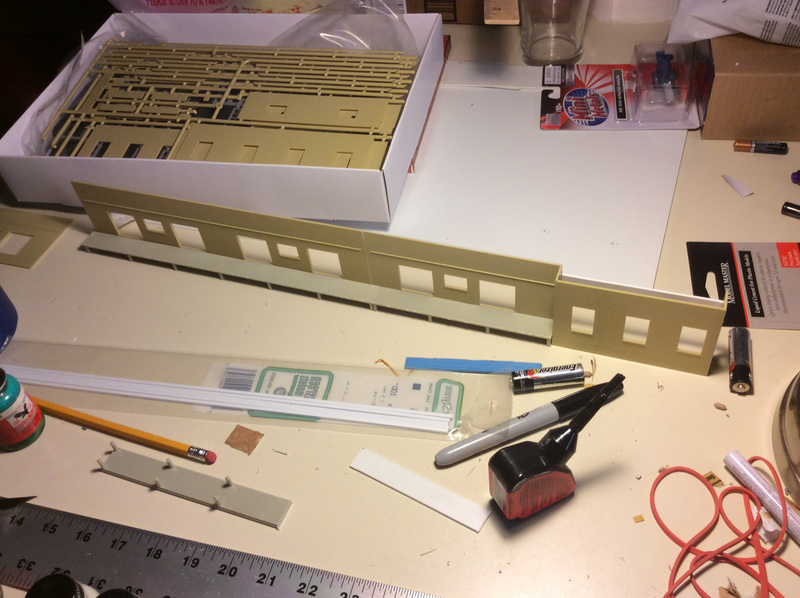 I’ve learned a lot from many of my mentors, particularly Lance Mindheim and B. Smith (Click here to see a bit of B. Smith’s layout), about taking a slower, more thoughtful approach to modeling and operating. It isn’t just about getting it over with or just completed. It can be about creating a special place for you. Thinking about all aspects of your layout features such as the history of each of the structures and what a particular business specializes in can really enrich your layout and make it an even greater expression of your art, your passion and your interests. Every building and every feature on the landscape, for that matter, has a story. Knowing it (or creating it) will make your modeling and operation experiences richer. There’s a place in Carrizo Springs where one can buy some salt licks, feed supplements and tractor parts and implements. 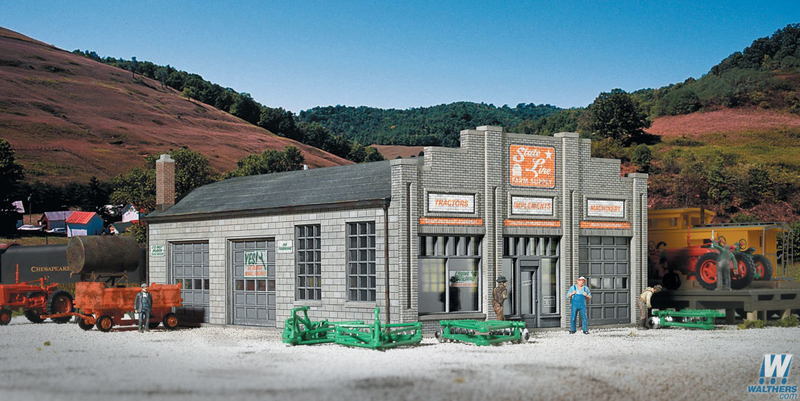 They specialize in International Harvester and have a fair parts supply on hand. It is also a good place to gossip with Marty and Jane, the proprietors, and catch up on the Wildcats (high school football), wheat and cattle prices and even a little local politics. Marty restores tractors as a hobby and has just restored a beautiful John Deere tractor he is trying to sell. As my previous structures, Walthers just happened to offer a perfect kit to meet my needs with very little modification. 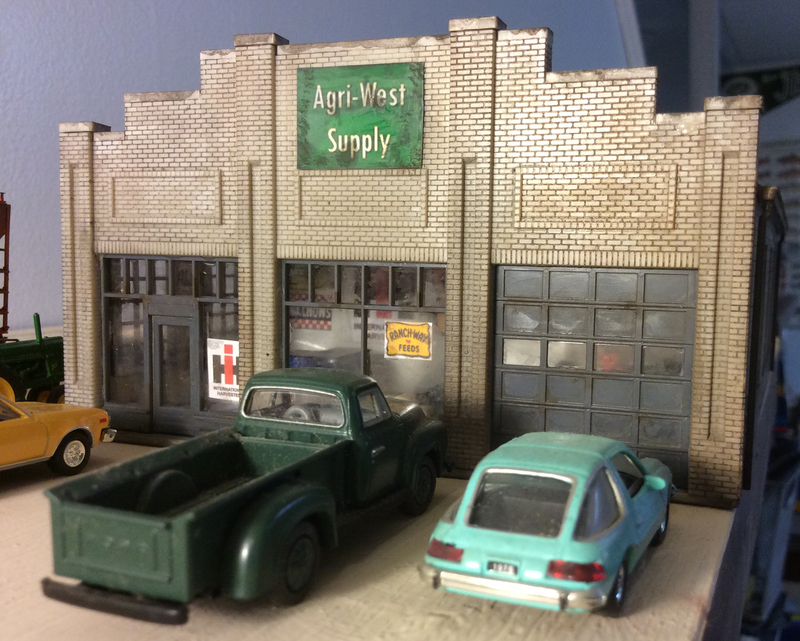 I opted for Walthers State Line Farm Supply. 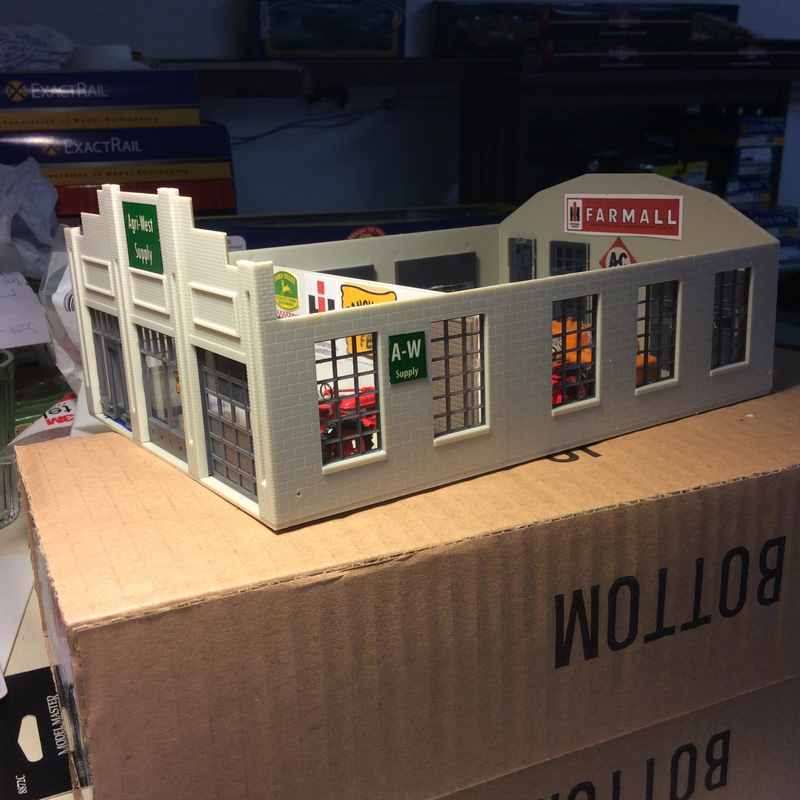 It is a very easy kit to build and it only took a couple of hours. It assembles very nicely. I created my own signs. The building has really nice lines and feels like buildings I have seen across the West. Now, the building has a lot of windows so I put a little effort into creating a very simple interior. Those are old International Harvester pickup truck advertisements on the walls. 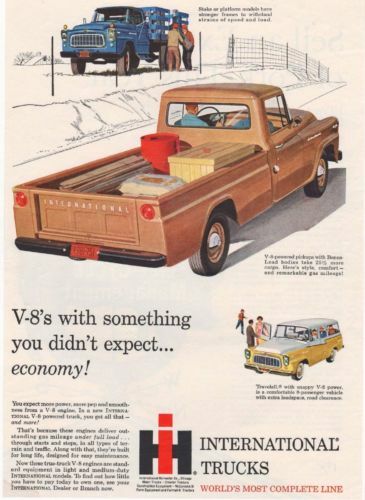 I have always liked the look of the old IH pickups. I sought to do just enough that so that the building would pass for being occupied. 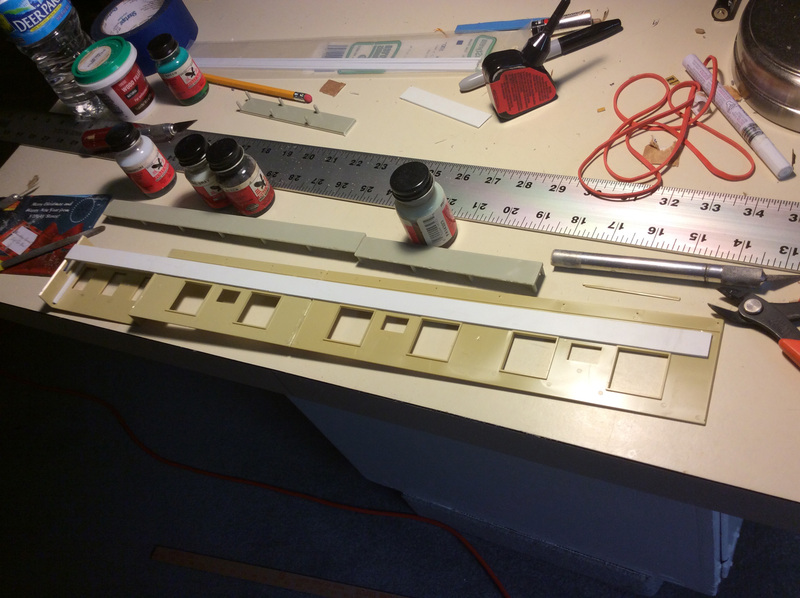 Next post will share the final product. 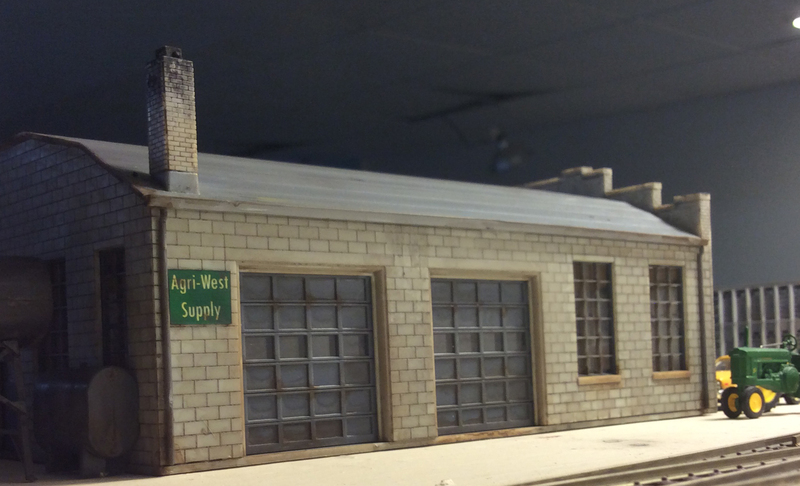 I will soon be posting a blog on another new structure for the Rails West layout. It will be a structure to reflect the western agrarian aspect of the layout. The area around Carrizo Springs produces a lot of wheat and some fruit in the valleys, the area is known for its cherries. A lot of thought went into the structure and I will be sharing my philosophy on the structure and what it means to the overall layout experience. I also wanted to share another couple of ways to connect with Rails West. I manage two Facebook pages that share additional photos and information and announces new posts to the blog. Facebook is a bit more interactive. The first is, not surprisingly, “Rails West.” — https://www.facebook.com/Rails-West-465010903652240/ Click here to check it out. The second reflects my earlier interest in modelling Roswell, NM in the early 1990s, a theme that surfaces in Rails West from time to time and remains a significant interest to me. https://www.facebook.com/atsf.roswell/ Click here to check it out. I took a lot of pictures in the late 1970s-early 1980s in Texas, Louisianna and Arkansas mainly and in the early 1990s mostly in New Mexico and Texas. I share photos from time-to-time via my Facebook pages. Example below. A lot of ATSF, MP. Frisco, Rock, SP, BN, ICG and Katy action. 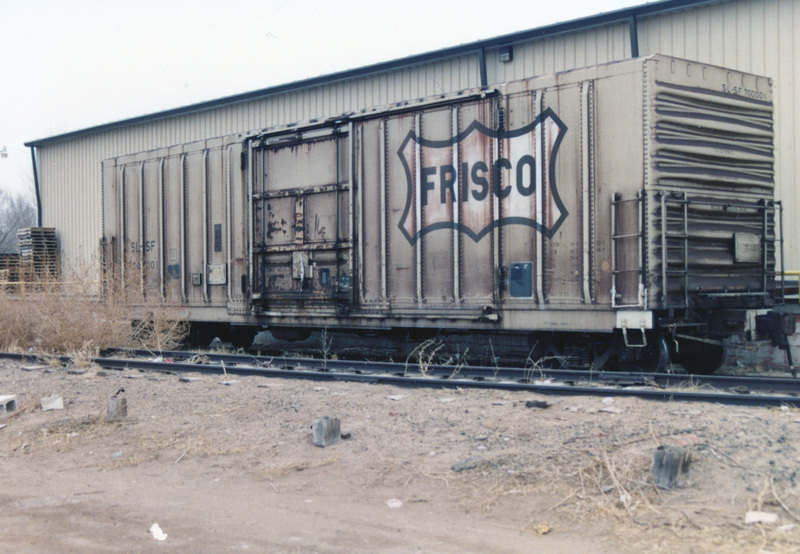 I also post some great pictures from B. Smith (mostly West Texas, 1970s-present) and a few photos I have collected over the years. Consider “liking” these pages if you’d like to see these photos and get updates on posts. 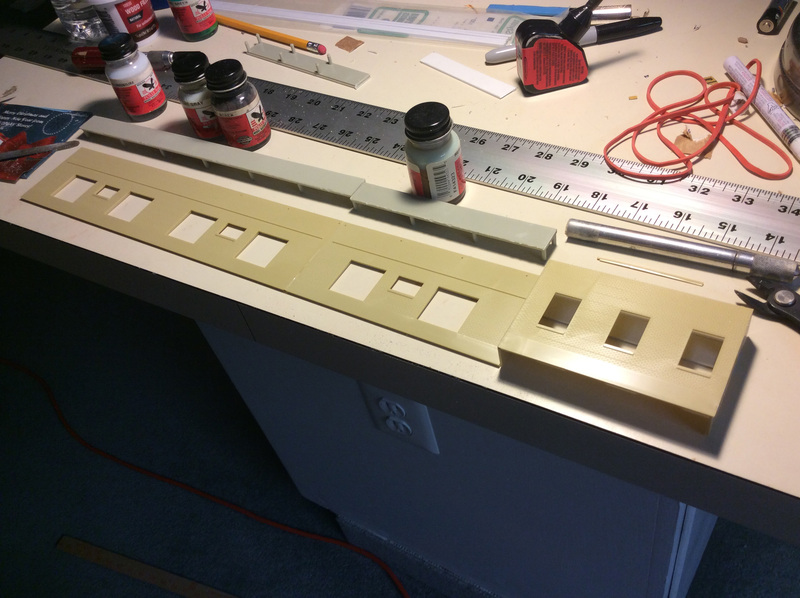 OK, once I got the structure the way I wanted, it was time for some serious weathering to capture the effects of a lot of use, wind, snow and an abundance of brilliant sun. 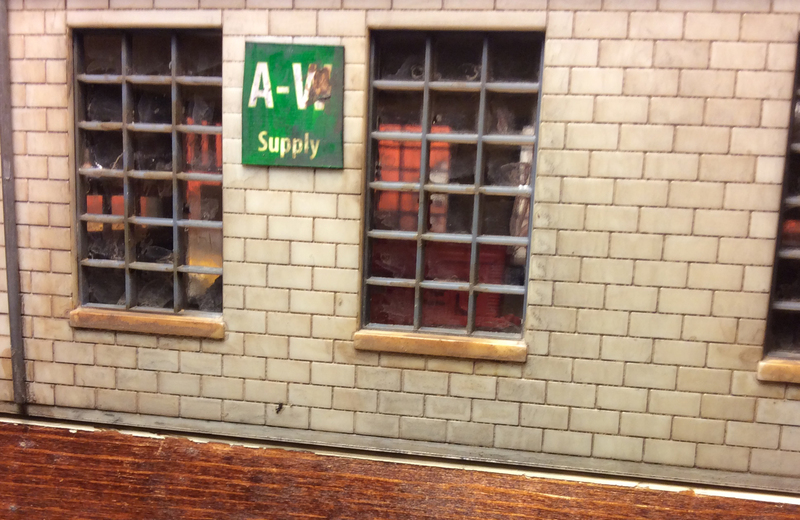 The warehousemen spend a lot of time emptying boxcars on this dock, and I wanted the place to show it! 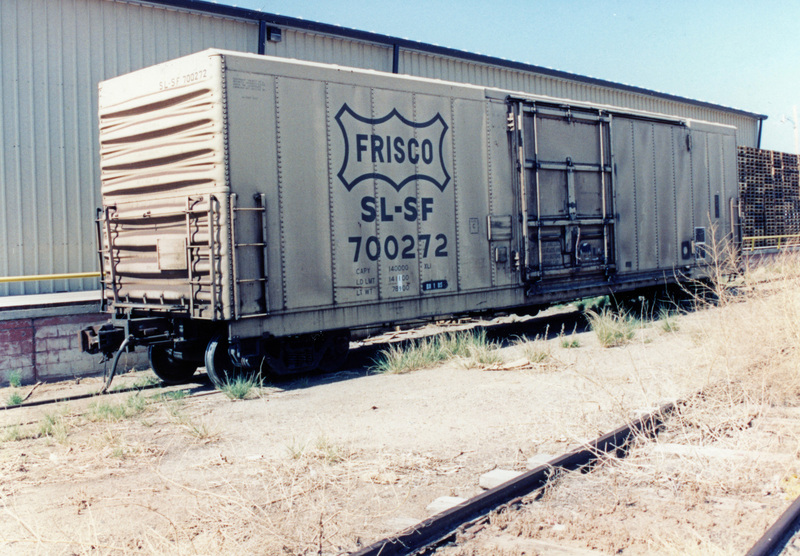 There is plenty of room for two 62′ beer cars. I really like not having to perfectly spot the cars either. There’s been a few instances of a little beer being spilled on that dock. Many a keg has tumbled around as well. The dock crew hates the short dock, but it was built in a different era. Mr. Hernandez got the building for a steal. 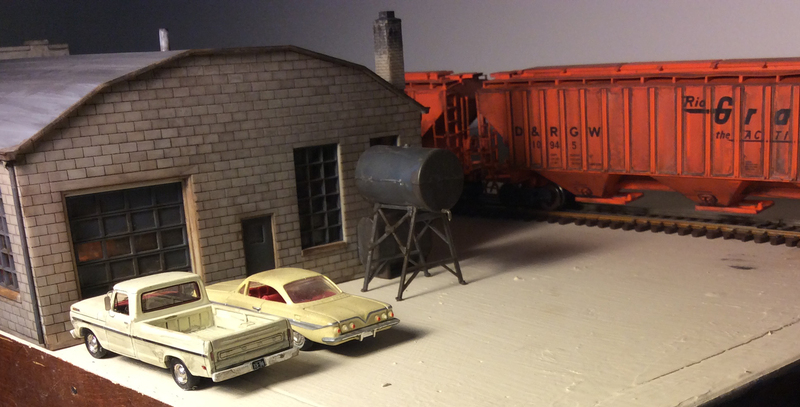 The crew has developed some workarounds to make it easier to unload the boxcars, but the dock manager alway gripes if the local crew spots a boxcar that is really off alignment with the doors. Paco or Jim usually come out to chat up the train crew during deliveries or pick ups. It’s probably a violation of some kind of rule, but the train crew usually gets a free case of beer around Christmas. It’s a nice tradition even if the FRA would frown on a couple of cases of beer in the cab. A lone 50′ boxcar looks pretty good spotted at the dock too! 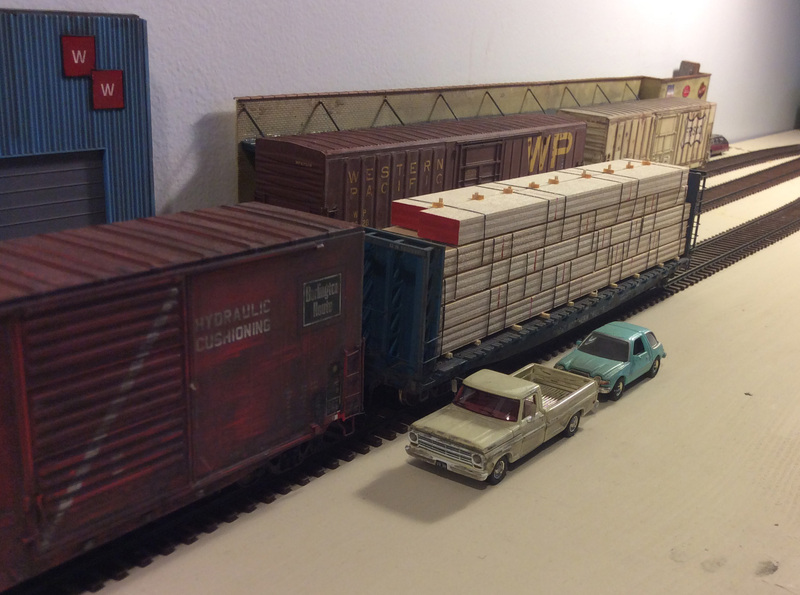 A couple of boxcars work well too. The team track is getting some loads delivered as the crew unloads some cases of Falstaff. I am satisfied with how the building functions and how it is in stark contrast to the more modern Western Warehousing structure next door. The Carrizo Spring Turn looks good rolling past it. To really evoke the West, I wanted a couple of structures to have swamp coolers. 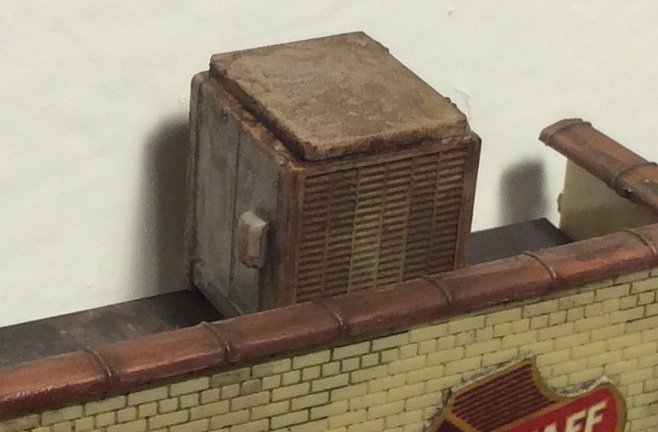 Swamp coolers work well in arid climates. They tend to get rusty due to the nature of how they operate. 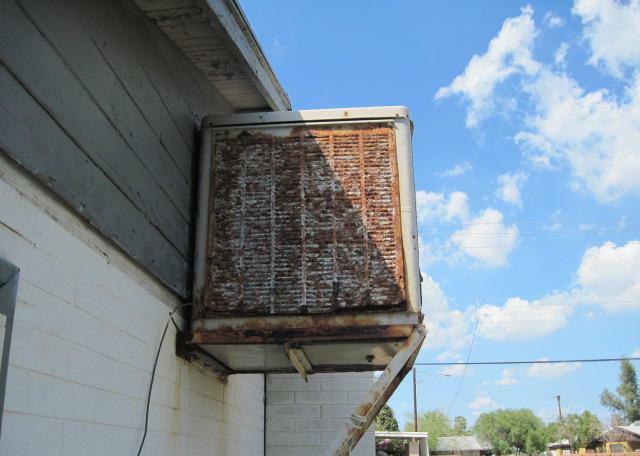 Swamp coolers, or evaporative coolers, work by adding water vapor to the air, which causes a lowering of the temperature of the air. This swamp cooler keeps the office cool for Mr. Hernandez and his office crew. The dock crew also has a break room that offers them a break from hot spells. They are a cool feature to add to structures when modeling arid climates. 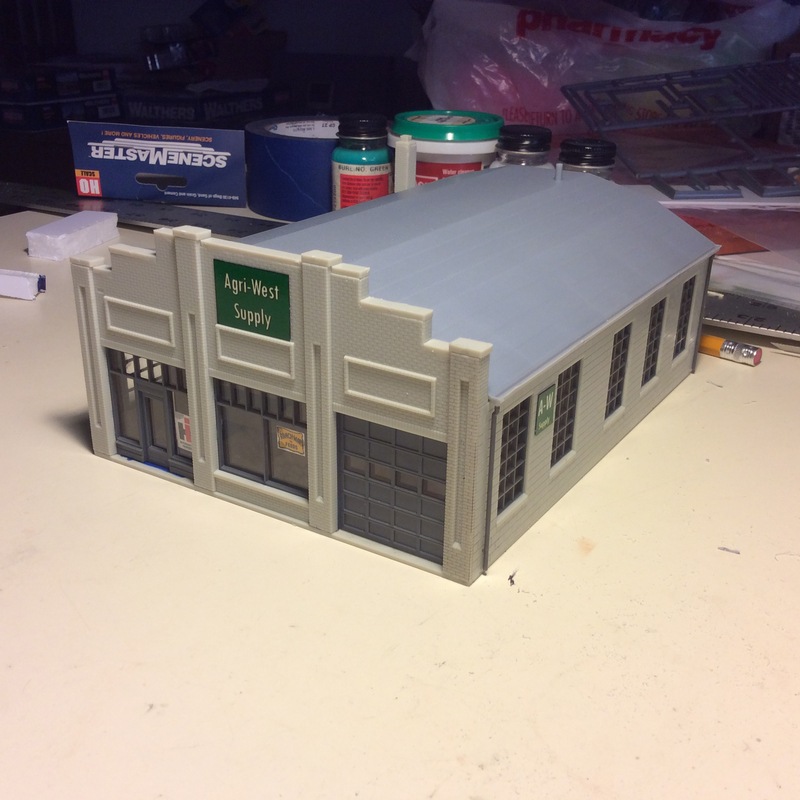 This is actually part of a set of roof details by Walthers. Capturing small details that reflect regional practices helps give your layout a sense of place as well. Well, it looks like the town is going to be in a better mood now the Hernandez Distributing is in place. It will provide a dependable source of traffic to the local as well. 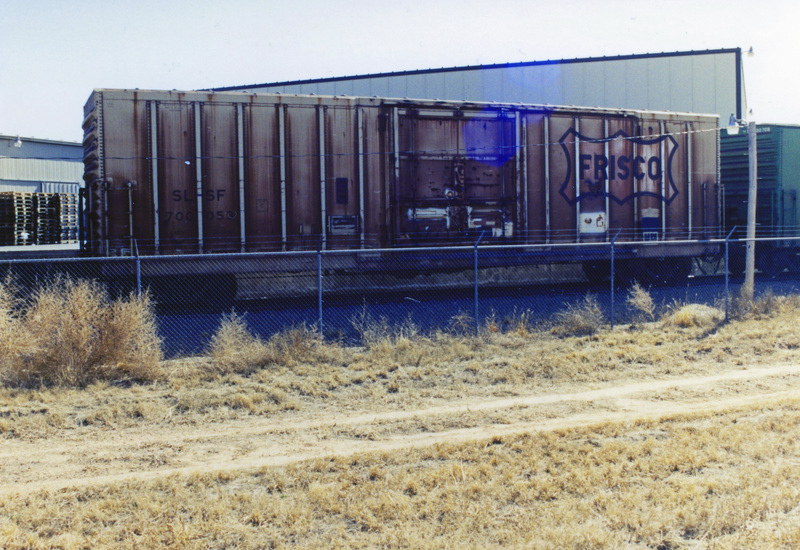 In closing, one more of my favorite shots I took of Miller Beer coming into Roswell, NM in the early 1990s. What a great way to ship beer. 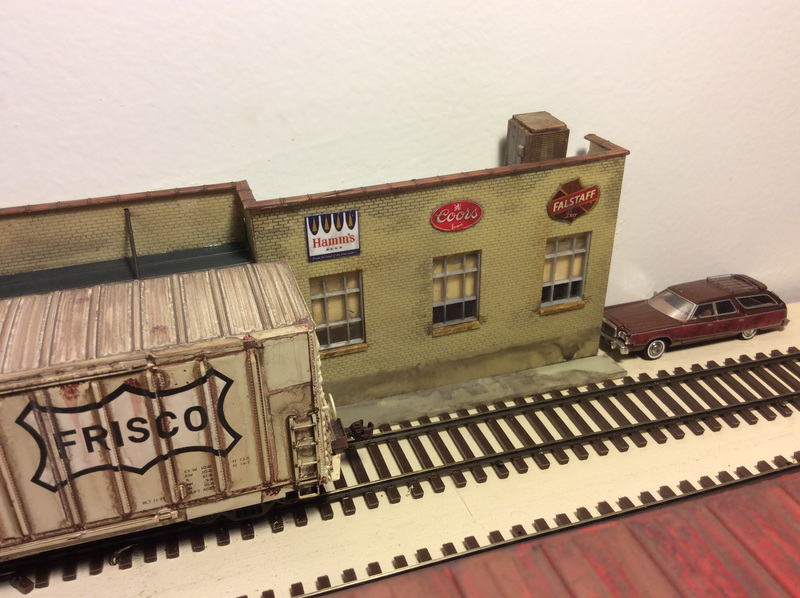 The psychology of model railroading is fascinating. Why do we do it? I could give you many answers, but one that comes to mind right now, is the ability to create a model that was/is special to us. A place that we control. A place where if we like a particular scene or place, we won’t let it change. We don’t have to let a 300 units subdivision or big box store scar our layouts. We can keep it just like we want it. We can create what some people call a sense of place. 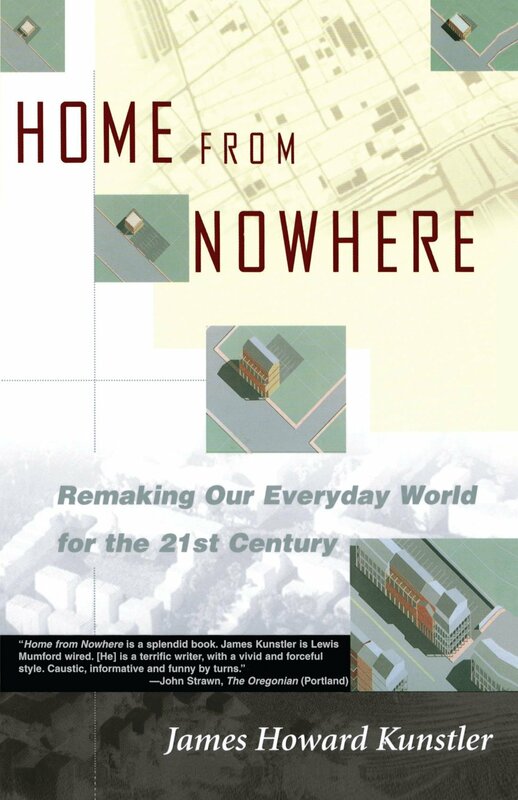 One of my favorite books on this is Home From Nowhere by James Howard Kunstler. It should be required reading for anyone who builds things on our nation’s landscape. Home From Nowhere by James Howard Kunstler. After reading this, you will never see where you live the same way. I find myself through Hernandez Distributing and my other efforts at buildings and scenery trying to create a mosaic of special places from my memory. 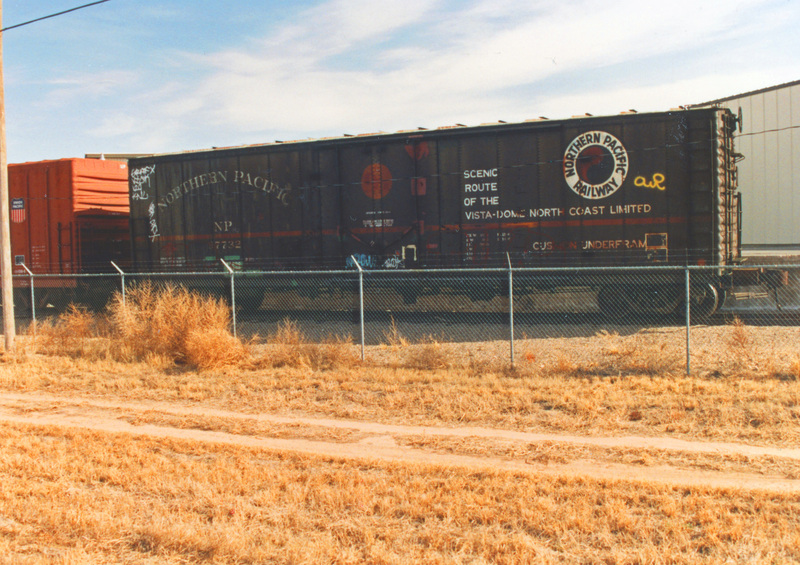 Living in Roswell, NM a number of years, I had to pleasure of keeping tabs on and photographing rail action at three different beer distributors in a town of 50,000 in an otherwise fairly remote corner of New Mexico. Through Hernandez Distributing I sought to capture the essence of the Budweiser, Coors and Miller distributors. It really resonated with me the thought of beer coming all the way from St. Louis, Golden and Milwaukee across the wide open spaces to these three nondescript buildings in a small to medium sized town in a sparsely populated region. I travelled to work a special way to let me keep tabs on the Miller and Bud distributors. Every few days new loads would appear. 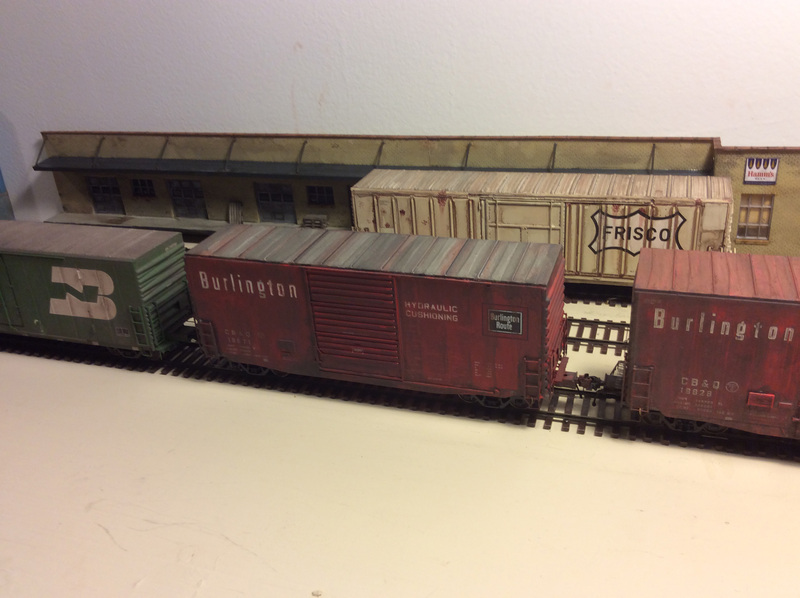 The Bud distributor was more active, especially around the holidays, sometimes receiving 4 boxcars at a time! 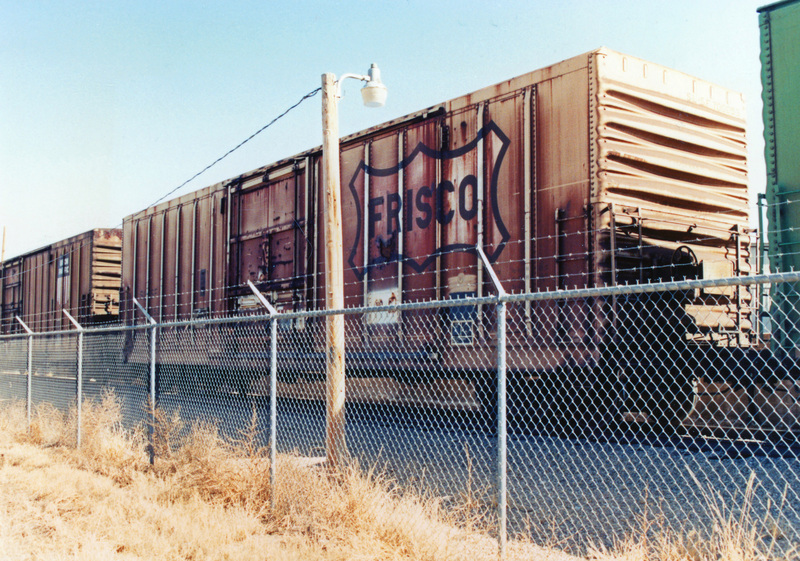 Here’s a SL-SF boxcar spotted at the Bud distributor in 1994. That felt like a little bit of a time warp in 1992–22 years after the NP ceased to exist. 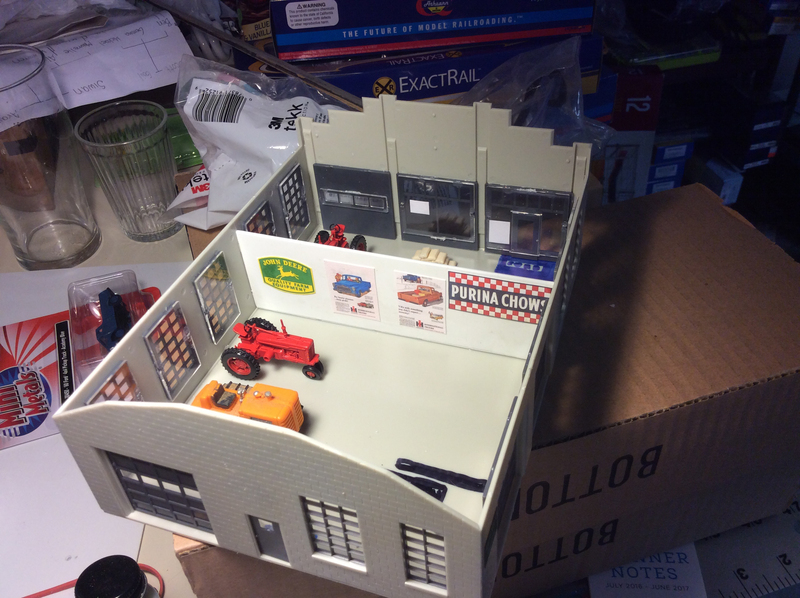 I sought to create a background structure that would capture the essence of the three distributors, permit a dock to make spotting cars easier and had a great, old school 1981 feel to it. Maybe, it was a building that had been converted from some thing else. 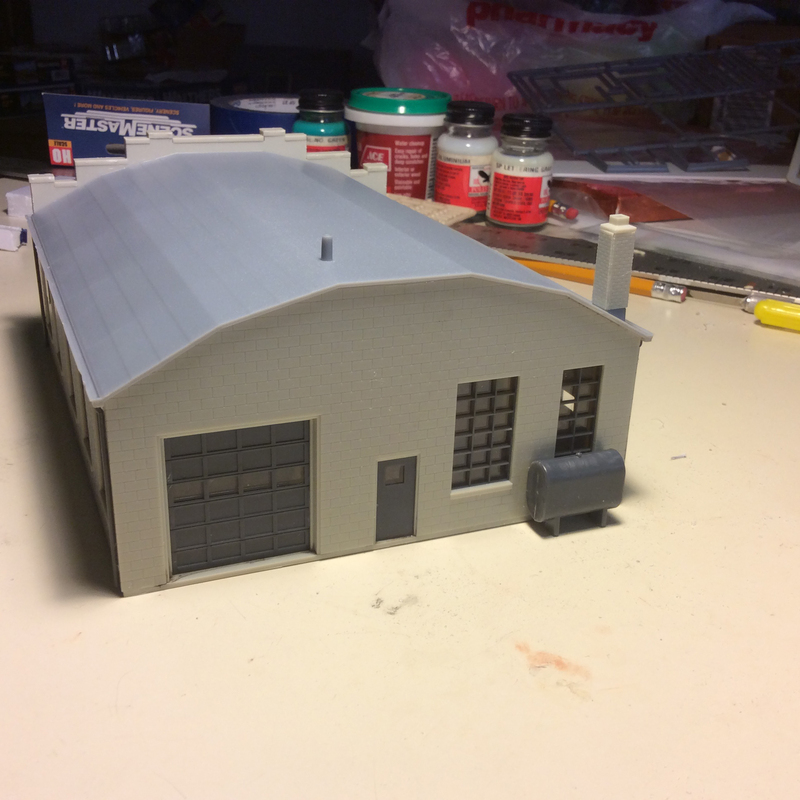 Wanting to kitbash, I researched until I found the right building as a starting point, much like I had done with Western Warehousing. 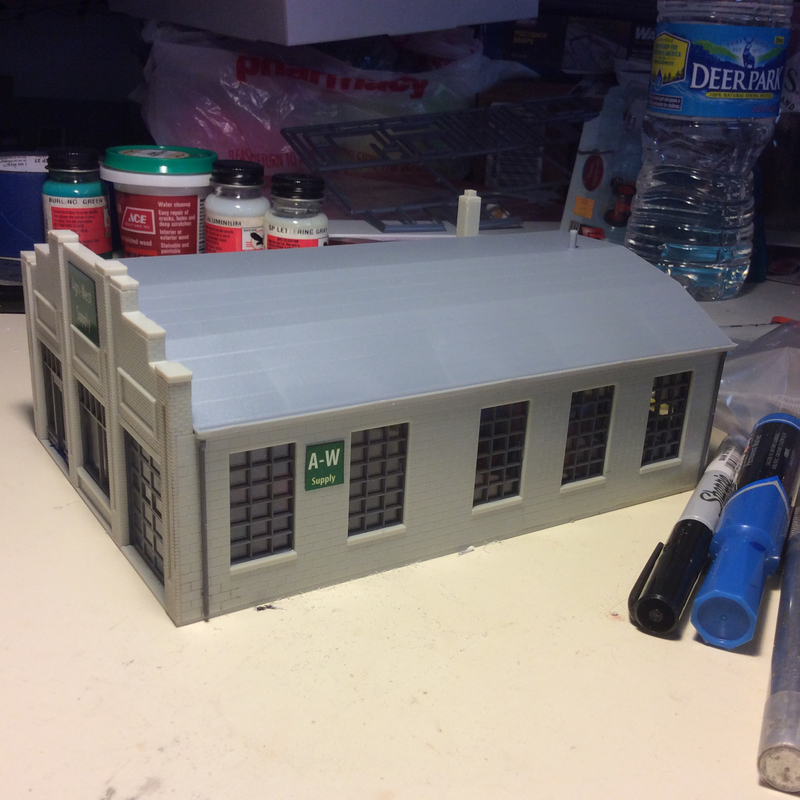 I settled on another Walthers kit–Grocery Distributor. I need two of them for my project because I wanted a long dock. Merging two of the dock sides I created a long unloading facility, large enough to accommodate two beer cars. 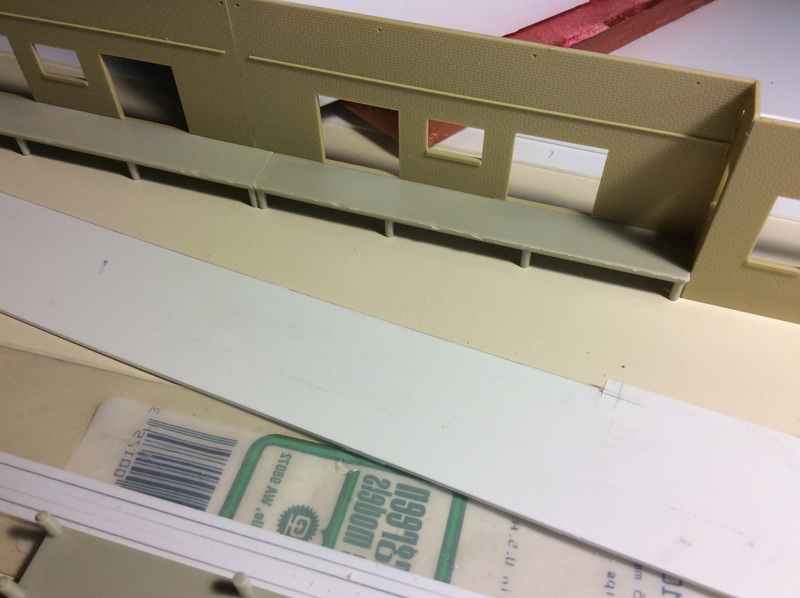 I then cut the loading dock to fit the revised structure. 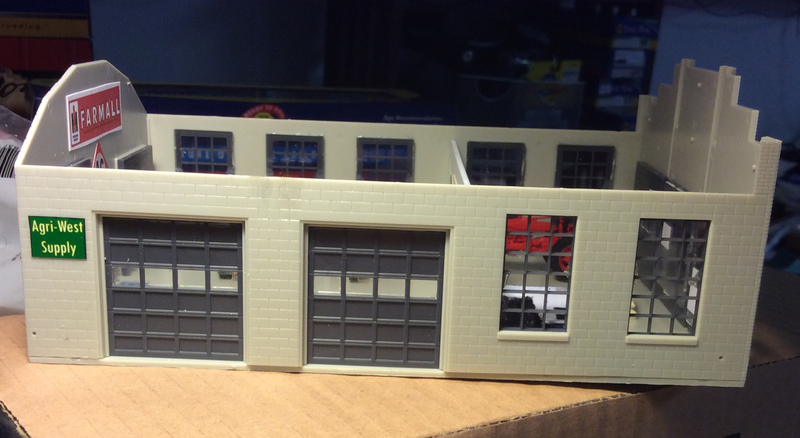 Once I got the shell like I wanted, doors and windows were next. I painted the back of the window glazing with a heavy wash of grimy black and applied a few great 1981-era beer signs–some of I my favorite iconic brands from the 20th Century. Now it is time to weather. That will be covered in part II.